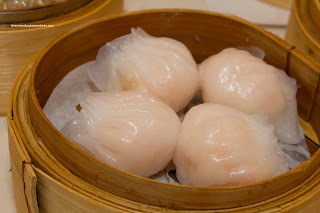 As such, we met up with Viv's parents for Dim Sum. For a weekday, the place was packed and bustling with activity. Due to the physical size of the restaurant, the tables were very close to one another and having push carts didn't help either. The result of having push carts in such a small restaurant was the instantaneous appearance of food. Our table was full after 2 carts since they had most of the stuff we wanted. Starting with the classics, we had the Haw Gow and Sui Mai. As illustrated in the picture, the shrimp dumplings were pretty large. 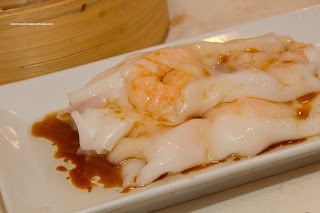 The filling was a good mix of whole crunchy shrimp and shrimp mousse. It was well-seasoned and sweet. It was really too bad that the dumpling skin was a tad thick and chewy. 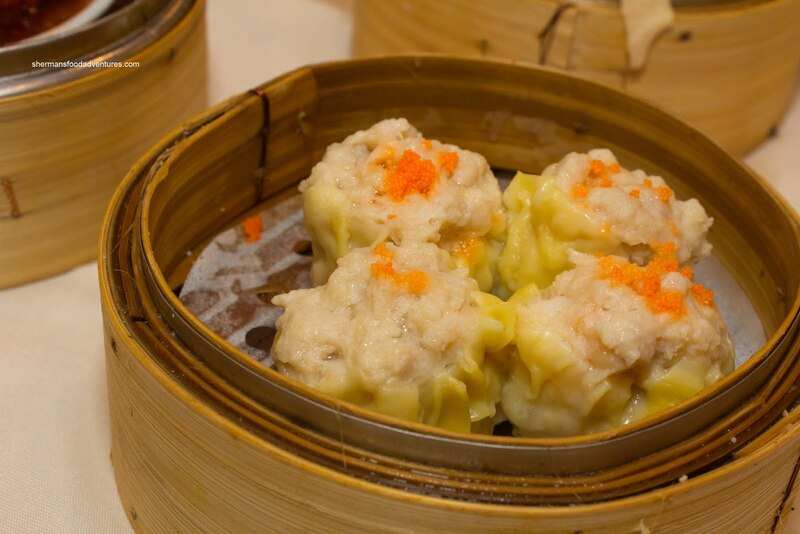 We weren't that enthused with the Sui Mai as it was pale and "loose"-looking. 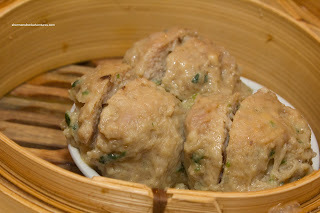 In fact, the appearance pretty much summed up the pork dumpling. It was too soft, possibly either over-tenderized or mixed with too much filler (fat). Hence, there was not much texture nor meaty flavour. The same could be said about the Beef Meatballs as well. Once again, they were fairly pale which wasn't exactly aesthetically pleasing. I don't know about you, I like my balls with colour... er... One bite into these and yup, these were some mushy balls. Too much baking soda and/or processing. Too bad really since there was a nice balance of seasoning from the green onion and dried orange peel. 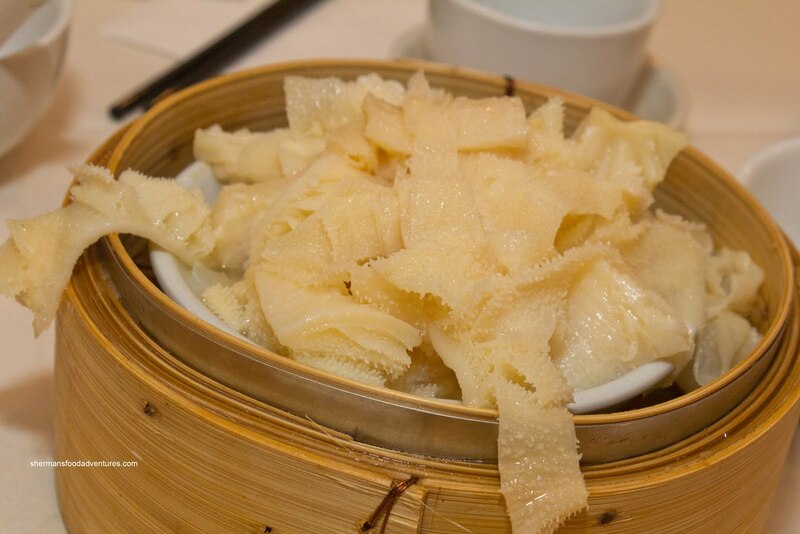 On the other hand, the Bible Tripe was properly tenderized where it was soft, yet still retaining a certain level of chewiness. It was a fairly large portion as you can see in the picture as it was spilling out of the sauce dish into the bamboo steamer. 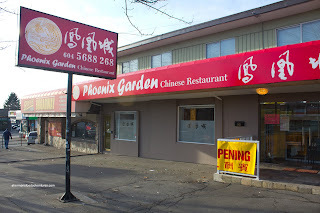 Funny how I just mentioned this recently in my Golden Lake (what's with all these "golden" restaurants?) post. Anyways, there was ample seasoning with good hits of ginger. 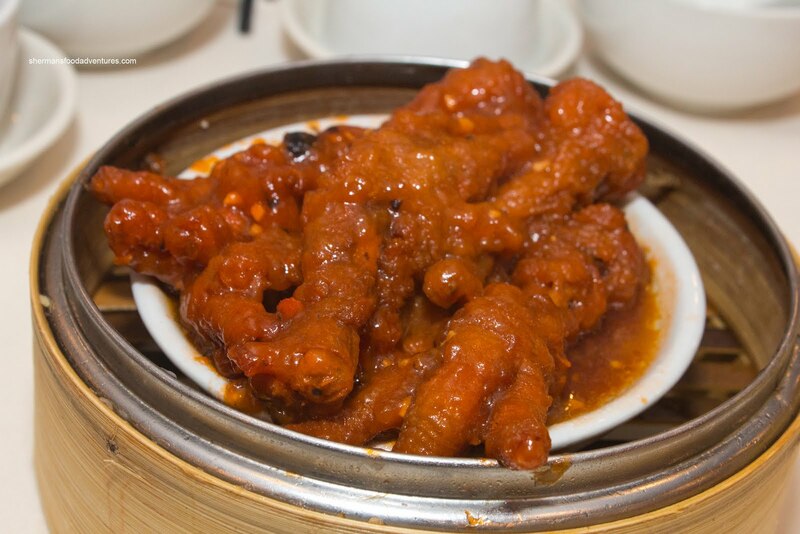 From tripe, we moved onto chicken feet or Phoenix Talons as they are more affectionately known. Well, despite the restaurant's namesake, these phoenix talons were pretty average. Definitely overcooked with the skin and gelatin detaching from the bones. Hence, it was clumpy, especially with the abundance of overly sweet sauce. A bit heavy on the MSG here. The Shrimp Stuffed Eggplant was good and bad at the same time. First with the good where we found a large amount of whole shrimp atop the large slices of eggplant. We surmised that they used the haw gow filling as the stuffing. This was further enhanced with the flavourful black bean sauce. 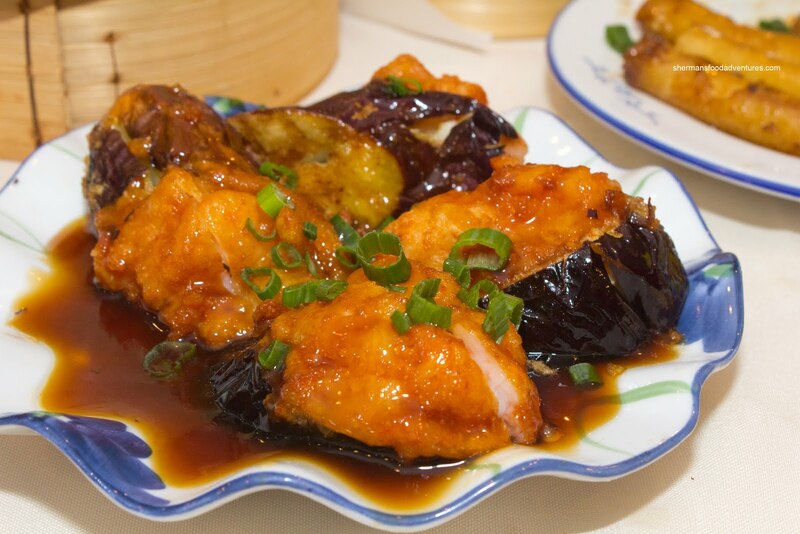 However, the whole thing was fried probably too long which made the exterior too crispy which in turn made the dish taste oily. I could actually taste the oil when I bit into the shrimp, which was not really all that appealing. Despite its plain appearance, the Steamed Pork Spareribs were pretty good. The best thing going for it was the meat itself - there was plenty of it. 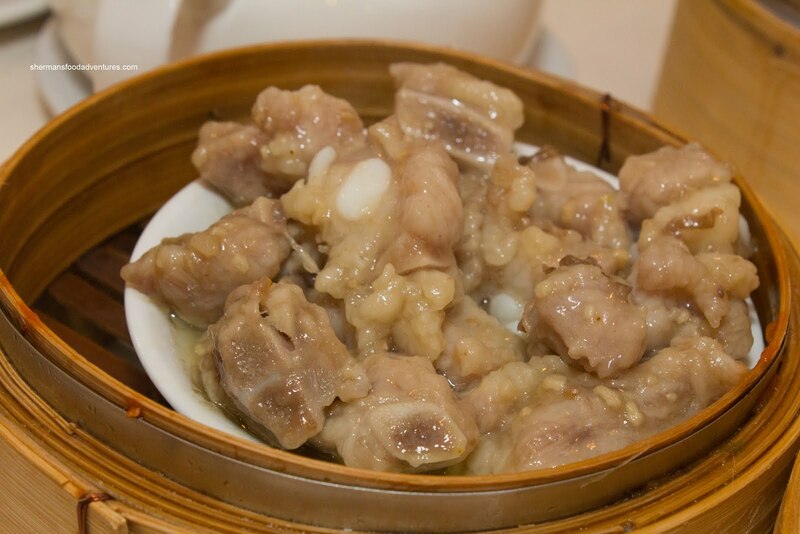 With very little fatty or cartilage-laced pieces, we got the cream of the crop in terms of spareribs. Furthermore, the meat was tenderized and marinated properly where it was soft enough to chew while still exhibiting the "bounce"-like texture at the same time. Lastly, it was seasoned with plenty of garlic and sodium (yes, it is necessary). So far into the meal, we were munching away, including my daughter. She was happily eating most things. Not my son though. He was waiting for the rice noodle rolls. So we grabbed the first one that passed by being the Shrimp Rice Noodle Roll. Of course I had to take all the shrimp out for him (his loss!). Overlooking the poor preparation of the roll (see the exposed shrimp on top), it was pretty good. Inside the fairly soft noodles were large whole shrimp that exhibited the requisite "snap". 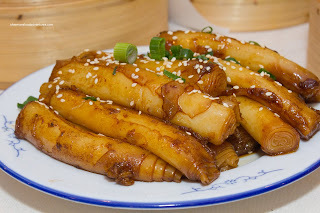 Then finally, the dish my son had been waiting for passed by - the Pan-Fried Soy Rice Noodle Rolls. Good thing I acted fast, since it was the last one on the push cart. Plated neatly and showing a pleasant caramelized colour from the dark soy, the noodles looked good. And yes, they were good. I particularly liked the balanced sweet soy mixture they used while frying up the noodles. It really did exhibit a caramelized flavour which matched its appearance. Texture-wise, it was soft while still having enough chew that it didn't fall apart during cooking. By now, we weren't really all that hungry anymore due to the generous portion sizes. However, with push carts, food kept coming around and hey, it did have an influence. 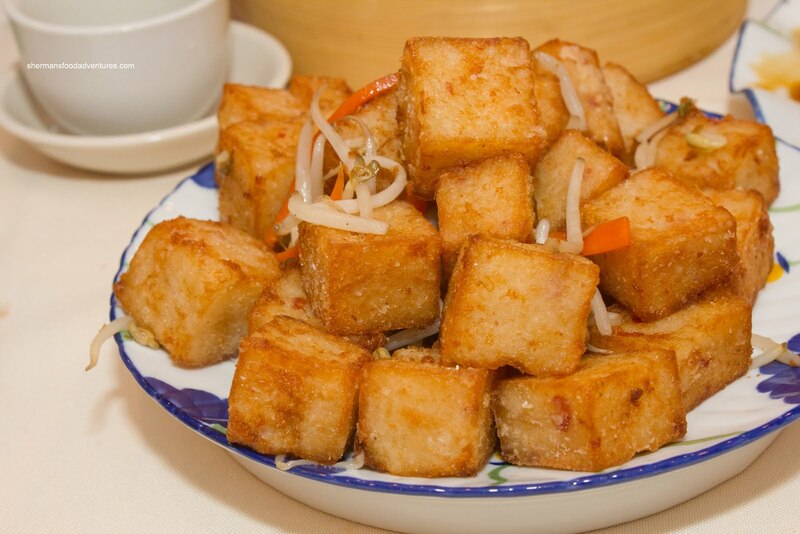 Hence, the Fried XO Daikon Radish Cakes caught our attention. 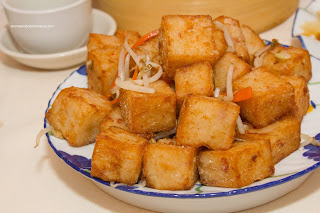 Normally, these are sliced into squares and pan-fried, but the fried cubed version is becoming more prevalent. In fact, this preparation would in theory result in a less oily product due to the quick flash frying in high heat. It was such the case here where the daikon cake was crispy and not greasy-at-all. It was tossed in XO sauce which added some spiciness. However, we felt the daikon cakes were far too dense and lacking in inherent flavour. In order to defeat the evil "Chinese Dim Sum food expeditor" and his sinister ways, where s/he sends out dessert first, we asked for it last. And wow, did they really save the best for last. After an uneven Dim Sum service, we didn't expect these awesome Egg Tarts. 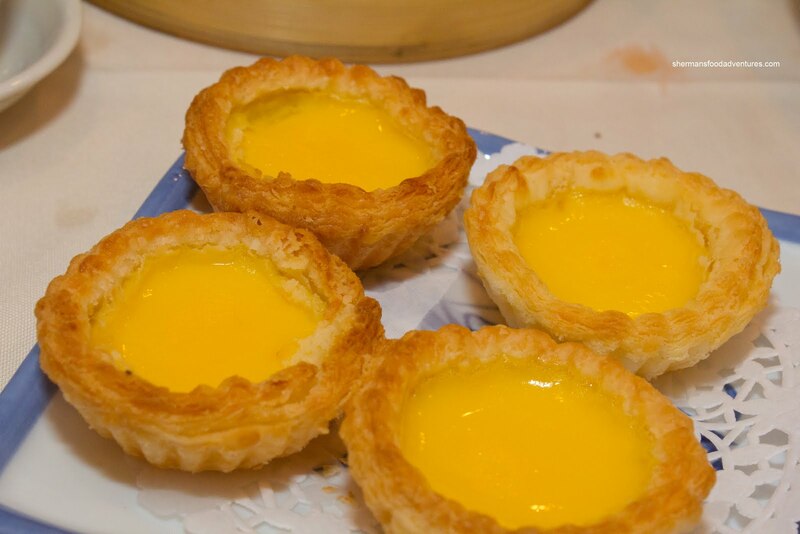 We agreed that these were some of the best Dim Sum egg tarts we've had lately. The puff pastry tart shell was light and buttery (or lardy). It was baked beautifully where we could taste the nuttiness from the copious amount of butter (or lard). It was flaky from top to bottom. Moreover, the egg custard filling was light and just sweet enough. Again, the nuttiness from the butter really helped make this egg tart. That was a sweet finish to an up and down Dim Sum service. Although pretty average as a whole, the large portion sizes and reasonable pricing makes Phoenix Garden an option for those who are not picky.